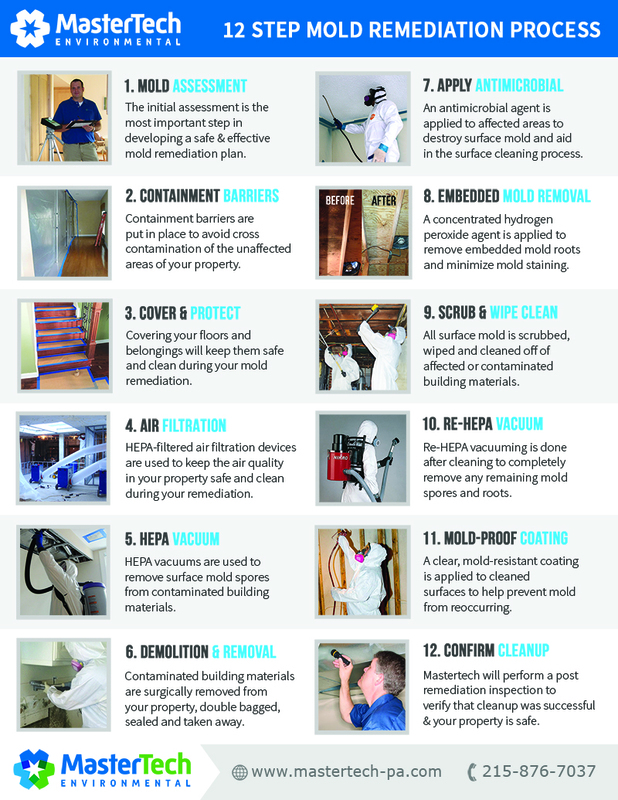 Mold development in your Bucks County, PA home or business is not only unpleasant, but can be very dangerous. When it comes to mold, MasterTech of Eastern PA’s certified team of experts understands the risk that you and your family are up against. That is why we have taken every measure to carefully train each of our inspectors and technicians to handle each mold contamination safely and efficiently. At MasterTech, we are devoted to providing a high quality, honest, and affordable mold removal service throughout Eastern Pennsylvania. If you are suspicious of a potential mold infestation in your residential or commercial property, your first step is to consider having a certified mold inspector conduct a thorough mold inspection in Bucks County, PA.
Our mold inspectors undergo extensive training and certification to ensure they are fully qualified to properly handle and report on your potential mold issues. MasterTech mold inspectors are trained to use the safest equipment and techniques to conduct a proper mold inspection in Bucks County, PA.
At MasterTech of Eastern PA, we are committed to providing you and your family with the safest and most effect mold remediation possible. We use the most advanced mold removal equipment and techniques for each mold removal in Bucks County, PA.
Causation: We will locate the water source that is promoting the mold development. The water source and all damp building materials must be appropriately addressed to guarantee an effective cleanup. As part of the mold remedaition, MasterTech will make recommendations for necessary precautions you and your family should take to prevent recurrence. For quality control purposes, MasterTech of Eastern PA will conduct a post-remediation inspection and testing after every mold remediation in Bucks County, PA. It is a precautionary step taken to confirm that we did the job right and did not overlook any details. As an extension of our commitment to your safety and your family’s safety, every MasterTech mold remediation will backed by a 5-year mold-free warranty. It is our promise that the mold has been properly removed, and it will not come back. MasterTech Environmental is a family owned and operated, local company that specializes in environmentally services. We are one of Eastern PA’s top rated mold remediation contractor for residential and commercial buildings.